"The passage to zero hour" - a showcase of the creative exploits of New Zealander Alex Staines. An outstanding blog post on the colourful life (and afterlife) of the great gothic novelist, Ronald Hugh Morrieson from the 'naki. 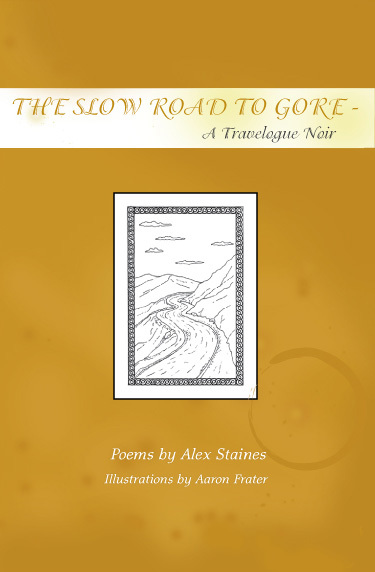 The 2010 second edition of The Slow Road to Gore - A Travelogue Noir (poems by me and illustrations by Aaron Frater) is now available for purchase as a Kindle e-book, on Amazon. Here's the book on Kindle. There's a lengthy book description to accompany the Amazon listing, which I have included in the current Kindle copy as a Foreword. However, I aim to replace this version with a new version soon that is better formatted for all Kindle devices (there are various complexities associated with uploading Word files to the Kindle platform that I have since become aware of). The "View Inside" option on the Kindle page shows some formatting errors that may carry over into some Kindle readers. It's a bit of a tricky business, but I'll update this post when the new version is uploaded. I have spoken to several people who say it looks and reads just fine on their Kindle readers, and it looks A1 on my desktop version of Kindle, too, but I'm seeking perfection! I was planning to remove the Foreword from the updated version of Gore, and have installed it here as a page. The updated Kindle version of the book will have a link to this page instead of the text itself. This is so potential buyers of the book can preview more of the poetry, as the preview pane on Kindle only allows for people to read a couple of pages. I don't want half of this taken up with a foreword spiel which is kind of self-indulgent (though fun). The follow-up to Seclusion Data, a new poetry project titled Time of the Archons, is well under way. The focus with Archons is on a music/poetry album and video, rather than on the printed volume and live performances that characterised Seclusion Data. Part of the Archons project is to re-record the vocal and re-mix the Seclusion Data tracks currently on Soundcloud, and re-release this as an album on Bandcamp, prior to the release of Archons. Steve Wolf has composed keyboard tracks for the Archons album, and I'm rapt that talented Wellington composer Brad Jenkins is working on electronic music to accompany Steve's piano compostions. And of course, the poems. I've finished 12 out of 36. The Muse is an inconsistent diety, or rather my responses to her are inconsistent. I know what I'm doing and the poems will be finished - I'm thinking around mid-2016 (this year). Live performances of Seclusion Data in 2010 in Wellington were accompanied by a soundtrack. The soundtrack was composed by Steve Wolf, performed by Steve Wolf (keyboards) and Guy MacGibbon (guitar and bass). 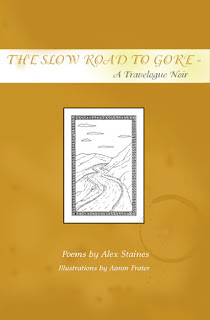 Poems and vocal by Alex Staines. The live performances took place at Happy and Watusi bar venues in Wellington and Alex was supported by singer/songwriter Adam James Ring. I'm currently re-recording the vocal for the album version of Seclusion Data. This will be going live soon on Bandcamp under the "band" name Alex Staines with guests. Video short: The Voice of Foxton (2002), "an acid poetry postcard from small-town New Zealand", was completed thanks to a grant from Motive/Suspect Productions. Justine Flanagan at Motive/Suspect expertly edited the video. I produced, wrote and directed the video. The camera and sound gear (very minimal) was expertly wrangled by the irrepressible Johnny Morris. The actors were me and the gorgeous Caron Dallas. Costumes were made by the late designer Gina Toscano, and director's assistant was the talismanic Aaron Frater. It screened at festivals in NZ and at Antimatter Festival in Canada (clicking on the image of the programme cover takes you to a PDF of the 2002 programme). View The Voice of Foxton on YouTube. Poet Alex Staines, a veteran of hundreds of live performances both as a solo act and with other performers, including Luke Hurley, Dave Murphy, Sam Hunt, Chris Knox and Paul Ubana Jones, and who has not been seen on stage for 15 years, emerges again at Happy Bar in Wellington on Thursday, August 19th. Seclusion Data is the title of the performance, and of Staines' new, third volume of poems. For the first time in his career, Staines will have musical accompaniment in the form of backing tracks composed and arranged by Steve Wolf, who played saxophone with Sam Manzanza, Bill Direen and Head Like a Hole. The music is performed by Steve, with Guy MacGibbon of the Flanneltones. Staines says he has always dreamed of incorporating music into performance poetry somehow, and has finally found in Wolf, someone with the right 'poison': "Both of us have Dirt by The Stooges as our favourite song," says Staines. Staines developed an 'energetic' performance style in the eighties, based on his love for all things punk. His first published volume, a double act with fellow poet Mike Eager, was described by Tony Beyer in the Evening Post as "aspiring to and achieving some almost ecstatic moments of bad taste". Eager and Staines met in 1988 at the founding of the group Poetrycorp, a sort of attack-dog perfomance poetry troupe. 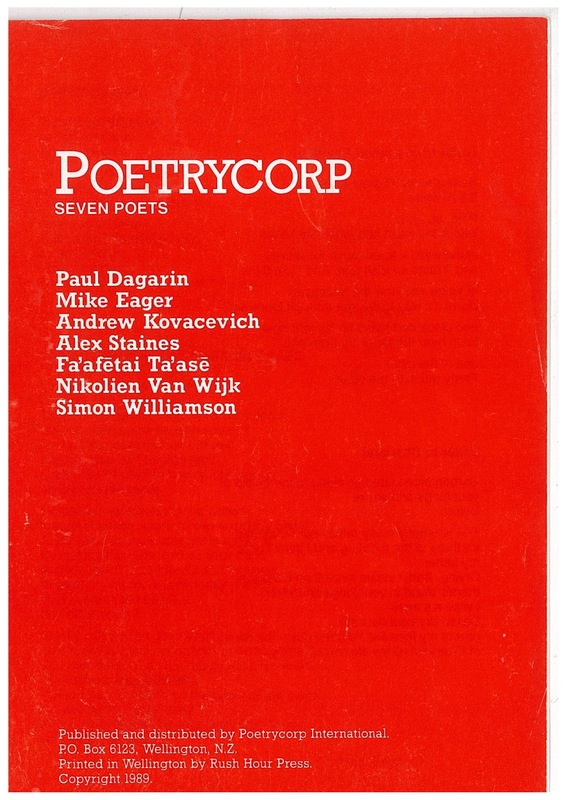 Other Poetrycorp personnel included Apirana Taylor, the late Andrew Kovacevich, the late Simon Williamson, Fa'afetai Ta'ase, Nikolien Van Wijk, and Paul Dagarin. Poetrycorp toured widely, mainly as part of university orientation tours, and attained what these days would be called a "cult following" - one reviewer described a show of theirs as "funny and scary". Staines published his second verse collection, The Slow Road to Gore in 2003 on the heels of his video short The Voice of Foxton, which screened at Antimatter underground film festival in Canada in 2002, as well as film festivals locally. Sam Gaskin reviewed The Slow Road to Gore in Salient and said: "...unlike the 'Pure' campaign - which is unsatisfying for Kiwis because it promotes an absence, Staines' New Zealand is dynamic, gritty, abundant and culturally diverse. Gore's detailed representations, vibrancy and strangeness offer enjoyment from plenty of readings." 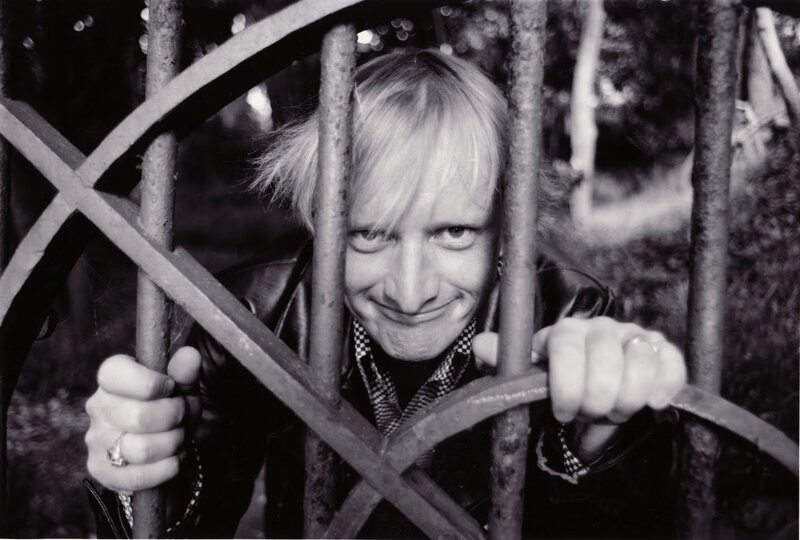 Staines began performing original material in 1984 at the famous Globe Hotel live poetry nights in Auckland, pioneered by David Mitchell, where he met and was influenced by performers like John Pule, Piet Nieuwland, Sandra Bell and Kim Blackburn. Staines says he has not lost his edge, and Seclusion Data is "a great book", full of strangeness and lyricism. Poetry lovers and appreciators of unusual performers will not want to miss this. The guest performer is songwriter Adam James Ring, who will be familiar to many lovers of local folk music. Alex Staines in a publicity photo for the 1993 Fun & Frets tour with Luke Hurley and Dave Murphy. This picture was used on the cover of Seclusion Data. Photo by Robert Axford, reproduced with permission. 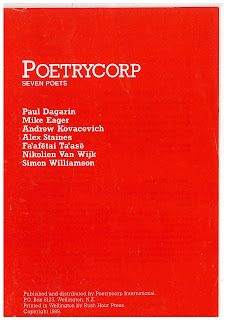 Poetrycorp was a collective of New Zealand poets dedicated to performance. Their sole publication as a group was a sampler, Poetrycorp - seven poets (Rush Hour Press, 1989). The group was formed by the Simon Williamson in Wellington in 1988. Poetrycorp toured New Zealand as part of university orientations, schools tours, and tours of institutions over the next few years, sharing a stage along the way with Sam Hunt, Paul Ubana Jones and Chris Knox. Poetrycorp were known for their full-on, highly entertaining, confrontational style, and picaresque leanings (Poetrycorp published a magazine of contributions from poets in institutions, entitled The Works, with help from a lottery youth grant). About 500 copies of this were stolen from the groups' Mini in Kaikohe while on tour, while cameras and personal equipment in the car at the time were untouched! * The late Simon Williamson (Simon's collection Storyteller was posthumously published by Headworx). * The late Andrew Kovacevich (who became well known as a comedian, won Comedy Store in 1989). * Alex Staines, still very much alive and being creative. * Paul Dagarin (following Poetrycorp adventures was editor of OUSA Literary Review and leader of the Dunedin band Polyp). * Fa'afetai Ta'ase (Samoan poet extraordinaire). * Nikolien Van Wijk (the embodiment of Dutch courage). * Mike Eager (published Warning with Alex Staines in 1990, and later, Living First Class in a Third World Country). * Apirana Taylor (a standard-bearing New Zealand poet). Poetrycorp poster for Bats Theatre season and tour in 1989 (left to right): Paul Dagarin, Mike Eager, Alex Staines, Apirana Taylor, Andrew Kovacevich. Original photo by Mags.